Sepax Opalshell™-C18 columns use a core-shell bonded silica stationary phase. 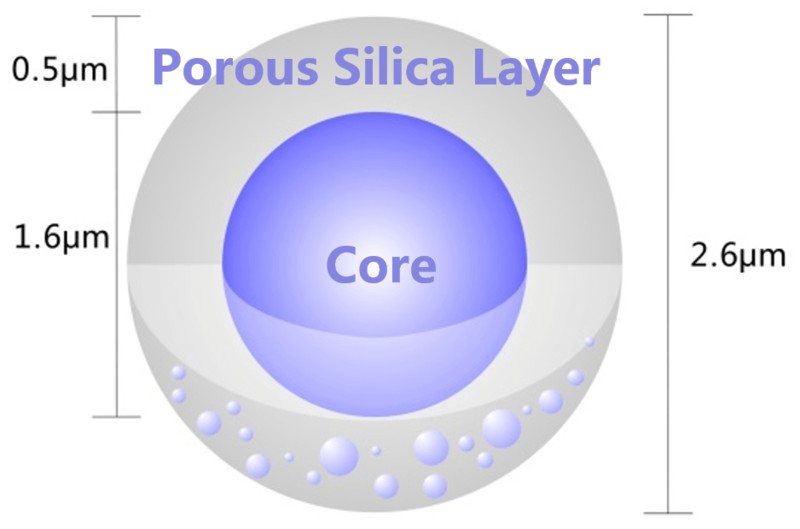 This core-shell bonded silica particle has a total size of 2.6 µm, comprised of a 1.6 µm solid silica core with a 0.5 µm porous outer layer. The uniform, spherical particles have a nominal surface area of 150 m2/g with a controlled pore size of 90 Å. The size distribution of the Opalshell™ particles is much narrower than that of conventional totally porous particles. This leads to reduced inter particle spacing in the column, achieving higher efficiency and performance by less eddy diffusion. 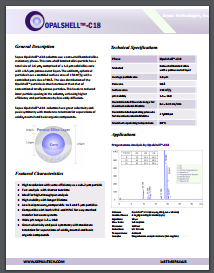 Sepax Opalshell™-C18 columns have great selectivity and peak symmetry for separations of acidic, neutral and basic organic compounds.